After years of sticking customers with clunky, ugly remote controls, television providers are suddenly infatuated with Apple's iPad. Cable companies, telcos, and satellite services are invading the iOS App Store with their creations, letting users take control of their televisions with touchscreens either from the couch or from afar. But not all iPad TV apps are created equal. Some have limited or nonexistent DVR capabilities. Others lack the full range of commands found on a traditional remote control. And when it comes to watching TV shows on the iPad itself, television providers are standing on shaky ground. Time Warner Cable, for instance, is taking three networks to court over the right to stream shows to tablets, and Verizon, which previewed an iPad app with live TV last August, eventually released an app without the live-streaming feature. The nature of the subscription-TV business means you can't take your pick of any iPad TV app, but you may have a choice between cable, satellite, or telco. So let's take a closer look at all of these apps (click the chart above to view it full-size), and find out how they compare. 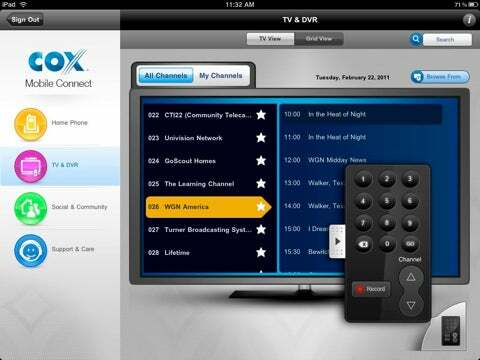 Cox Mobile Connect, compatible with Cox Advanced TV and Cox Digital Telephone services, lets users view television listings, schedule a DVR, and change channels with a little virtual remote. Next to the competition this app is pretty ugly, and the only standout feature is the ability to hear and manage voice messages if you're also a Cox telephone subscriber, but it gets the job done for a few basic tasks. Cox also offers apps under the same name for the iPhone and for Android handsets. 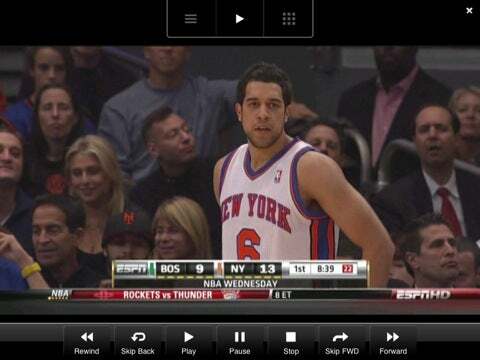 The Dish Remote Access app is the only one here that can stream DVR content and live television. It's also the only app that allows access outside the home over Wi-Fi or 3G. But neither feature is available without a Slingloaded DVR at home. In that sense, Dish's app mirrors the functionality of Slingplayer Mobile, an app that costs Slingbox owners $30. Without a Slingloaded DVR, Dish app users can still control their televisions with a full-featured virtual remote, view TV listings, and schedule a DVR and manage existing recordings, making this app a solid remote-control replacement. Handset versions of the Dish Remote Access app are available on the Android and iOS platforms. What the DirecTV iPad app lacks in features, it makes up for with a slick interface. 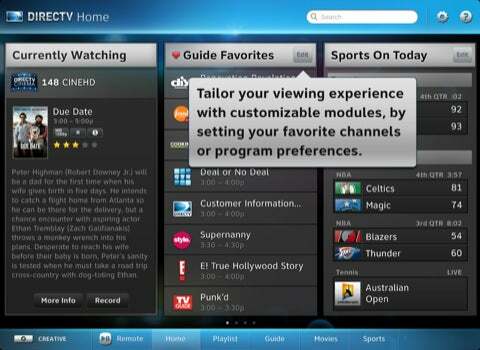 Users can't watch TV on the tablet or manage existing recordings, but they can schedule the DVR, select channels to watch, and use a virtual remote control. The app also includes preset channel categories and a customizable list of favorite channels, all of which appear as vertical panels running across the screen. DirecTV's app has a customizable sports section for keeping track of favorite teams and jumping between games, perfect for premium sports packages with lots of games happening at once. Similar to the previous iPad apps mentioned here, handset versions of the DirecTV application are available for the iPhone and Android.